Also known as Lepista nuda, and sometimes given the common name "blewit," Clitocybe nuda is fairly easily recognized when fresh and young--but older specimens can be confused with many potential look-alikes. Gorgeous shades of lilac and lavender on the cap, gills, and stem fade quickly; the cap becomes brownish, and the gills and stem fade to buff. But this color transformation is one of the mushroom's distinguishing features, along with its pale pinkish spore print, its lack of a partial veil, and its tendency to grow in piles of organic debris. Clitocybe nuda may look innocent enough, from a human perspective, but be glad you're not a soil bacterium facing this mushroom's mycelium in a dark alley. As George Barron's micrograph illustrates, Clitocybe nuda sends out tiny hyphae that penetrate bacteria colonies and kill them, sucking up their nutrients! Ecology: Saprobic; growing alone, scattered, gregariously, or in clusters in organic debris--in woods or in urban settings; late summer and fall (and over winter in warm climates); widely distributed in North America. Cap: 4-20 cm; convex with an inrolled margin when young, becoming broadly convex to nearly flat--or with an uplifted, wavy margin in age; surface smooth, slightly tacky when moist; sometimes finely cracked over the center; usually dull purple, or purplish with brown shades when fresh, fading to brownish, flesh-colored, tan, or paler--but sometimes brown or buff from the beginning. Gills: Attached to the stem--sometimes by a notch--or beginning to run down it; close or crowded; pale lavender to lilac, fading to buff, pinkish-buff, or brownish. 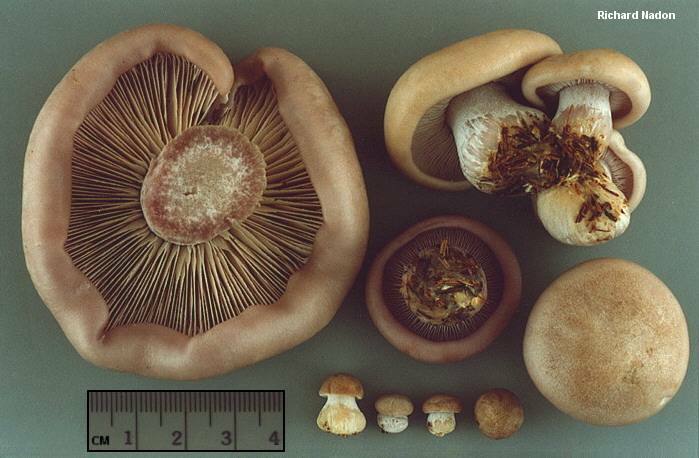 Stem: 3-10 cm long; 1-3 cm thick at apex; equal, or enlarged at the base; dry; finely hairy, and/or mealy near the apex; pale purple or colored like the gills; becoming brownish in age; base often covered with lilac to buff mycelium. Flesh: Thick; soft; purplish to lilac-buff or whitish. Odor and Taste: Taste not distinctive, pleasant, or slightly bitter; odor fragrant. Microscopic Details: Spores 5.5-8 x 3.5-5 µ; ellipsoid; roughened or sometimes smooth; inamyloid. Cystidia absent. Pileipellis a cutis of hyphae 1-4 µ wide. Clamp connections present. REFERENCES: (Bulliard, 1790: Fries, 1821) Bigelow & Smith, 1969. (Saccardo, 1887; Smith, Smith & Weber, 1979; Bigelow, 1982; Weber & Smith, 1985; Arora, 1986; Phillips, 1991/2005; Lincoff, 1992; Metzler & Metzler, 1992; Kuyper, 1995; Evenson, 1997; Barron, 1999; Roody, 2003; McNeil, 2006; Miller & Miller, 2006; Gregory, 2007; Kuo, 2007; Trudell & Ammirati, 2009.) Herb. Kuo 10129601, 10090305, 10150406. In this photo the cells of a Clitocybe nuda mycelium are attacking colonies of bacteria. See the discussion to the left.